Apple is facing a lawsuit related to a software flaw that allowed interlopers to eavesdrop on Group FaceTime calls, with the suit arriving less than 24 hours after news of the bug was circulated by mainstream media. The suit was lodged in a Houston, Texas, court by a lawyer claiming the FaceTime glitch enabled an unknown party to listen in on a private call he was conducting with a client, reports Bloomberg. According to court documents, Larry Williams II said the intrusion occurred as he was taking sworn testimony during a client deposition. Further details were not offered by the report, though it is presumed Williams received a call as he conducted the deposition via FaceTime. On Monday, reports of a massive FaceTime flaw surfaced on Twitter. Present in current versions of iOS, including the latest iOS 12.1, the bug enables a FaceTime caller to eavesdrop on a recipient device's audio even if that person does not answer. Camera access is also granted if the recipient interacts with hardware buttons on their iPhone, for example pressing the power button to decline the call. Perhaps most troubling was the relative ease at which the bug is exploited. A nefarious party simply calls another FaceTime user and manually adds the originating number to the call as a third party. Once added, audio from the recipient's device begins streaming without an indication that a call is live. It was later learned that Apple was notified of the FaceTime issue more than a week ago by the mother of a 14-year-old who independently discovered the massive flaw. Michele G Thompson, a lawyer, posted to Twitter a series of emails and bug reports sent to Apple detailing her son's discovery. One letter was dated Jan. 22, while a tweet containing a bug report related to the find dates back to Jan. 21. 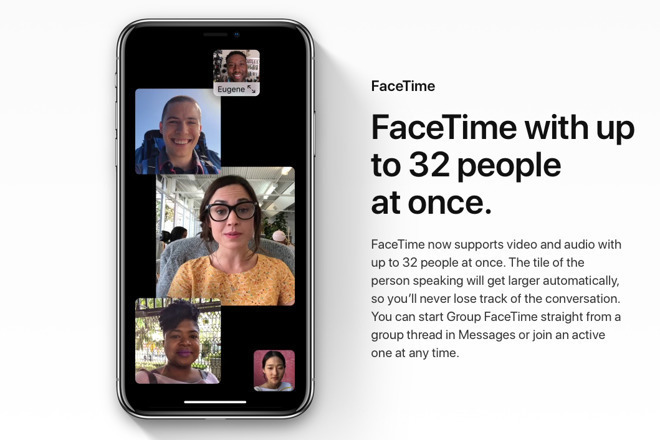 Apple addressed the issue by disabling Group FaceTime in a server-side cutoff late last night. The company is currently working on a fix it expects to release to users later this week. Williams claims negligence, product liability, misrepresentation and warranty breach in his suit against Apple. He is seeking unspecified punitive damages, according to the report.